Today's insect is a planthopper. 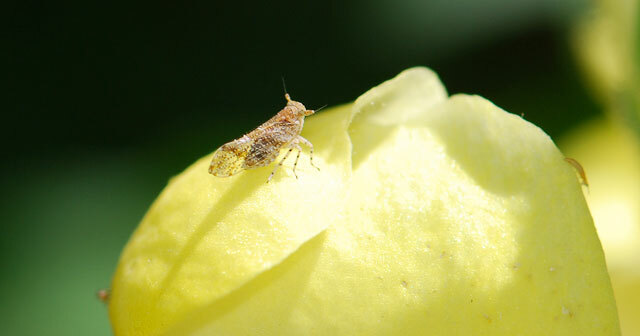 Planthoppers are related to leafhoppers and spittle bugs. You can tell this is a planthopper because of the position of the antennae, which are below the eyes. The antennae also are thick at the base and have hair-like structures pointing out, called aristae (singular, arista). This little planthopper belongs to the family Cixiidae. Cixiid planthoppers have see-through wings with patches and veins in shades of brown. The females lay eggs in the stems of plants and cover them with a waxy coating. The immature forms of these insects drop to the ground and feed on the roots of plants, like their much larger and noisier relatives, the cicadas. Once in awhile I will see the nymphs, as they are called, in the roots of a plant I am re-potting. 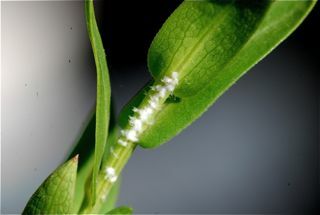 The nymphs often are decorated with patches of white wax like the eggs (Flickr photograph). Surprisingly, there are quite a few different kinds of these, around 300 different species in the genus Cixius alone. Because they are small and secretive, they rarely receive much attention. Have you seen a planthopper?